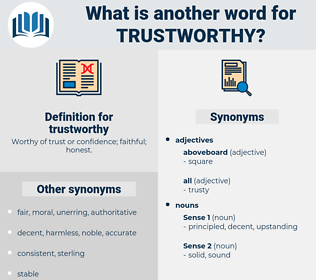 What is another word for trustworthy? Worthy of trust or confidence; faithful; honest. truthful, trustful, robust, unreliable, predictable, dignified, plausible, authentic, faithful, well-informed, accountable, viable, sound, creditable. 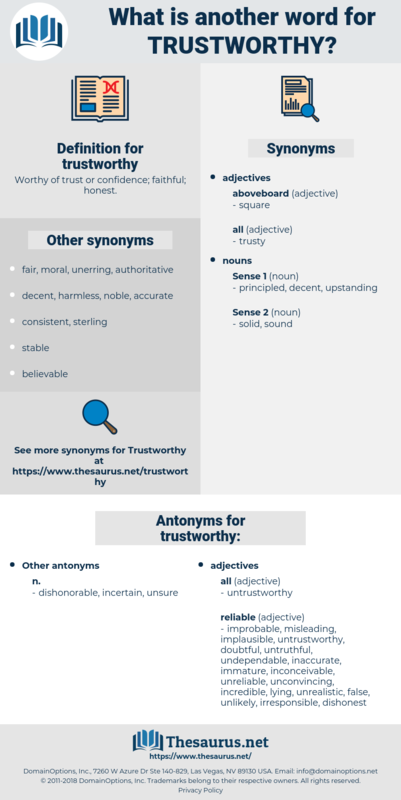 reputable, authoritative, worthy, honest, believable, solid, secure. unrealistic, incredible, unconvincing, implausible, untruthful, irresponsible, misleading, unlikely, inconceivable, dishonest, immature, false, lying, improbable, inaccurate. dubious, hazardous, questionable, untried, fishy, disputable, Doubtable, disputed, unsafe, dodgy, problematic, undependable, exploded, unauthorized, doubtful, unconfirmed, apocryphal, spurious, suspect, counterfeit, fabulous, debatable, risky, shaky, unsound, fictitious, unreliable, baseless. And safe - if the letter is trustworthy, and I think it is. We are all trustworthy, and I'll hide it.